I definitely have been absent from my blog, but lots has been happening. 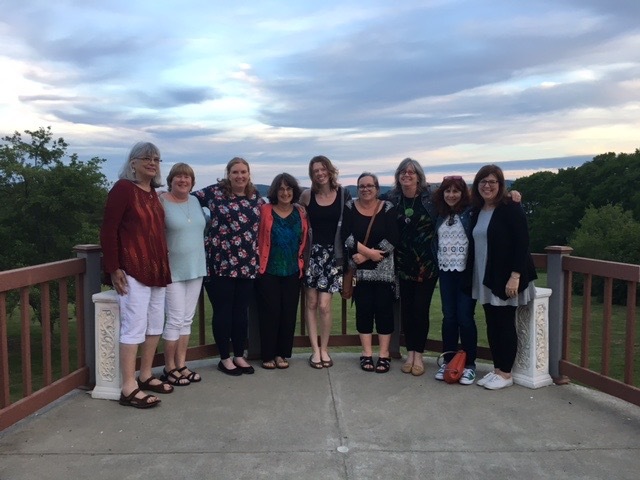 I survived the end of the school year, and drove off to Maine the following day for a writing retreat and workshop with dear friends. This gathering is an annual ritual that marks the transition from my day job to my heart job, writing! Each year our little band of writers invites a mentor to join us and guide us in seeing our manuscripts in new ways. We have worked with some fabulous folks over the years including Laura Ruby, Louise Hawes, Clare Vanderpool, and this year, Sarah Aronson. It is always such a treat to gather around the old farm table in the kitchen, or on the breezy porch by the bay, or to scoot the chairs and couches of the great room into a welcoming oval, and delve into the days’ manuscripts. We laugh, we cry, we inspire each other. We have built the kind of rapport and trust many writers only dream of in a critique group. I think each mentor who joins us soon feels like part of the tribe. We are blessed. After a fabulous and inspiring week, I extended my stay just a bit, staying with a good friend from the group who lives nearby. 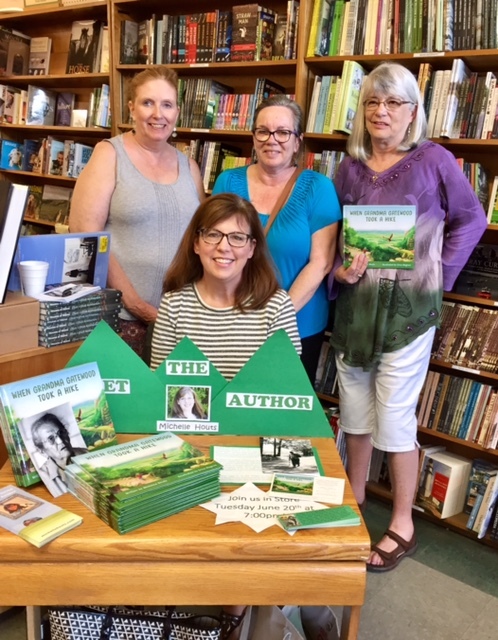 Apparently, we weren’t the only ones who had trouble saying goodbye to Maine, as we caught up with a few of them in Bar Harbor where Michelle Houts, one of our crew, was signing books. It’s pretty easy to feel supported and motivated when I have this great group of writers in my life, especially when we are all together, and the help I need, the listening ear, the new perspective may be as close as the chair, or room, next to me. But now I’m home, and I’m happy to be, but it will be harder to keep things moving forward. Today, for example, I spent the morning taking down my old mailbox, and trying to put up a new one. Just like with writing, there were setbacks (and a nasty blister. I’ll spare you the picture of that one!) and it would have been lovely to ask a friend for help with the task. Writing can be a lonely job (as can home repair), and I need to remember that I don’t have to do it all myself. Though my Mainely Writing friends are scattered across the country, they are only a text, or email, or Facebook post away when I need them for writing support. Do you have a creative tribe you can call on when needed? If not, it’s time to start gathering. Find your people! Love the “my heart job.” I would like to borrow that. Also, another lonely job is talking with someone half a world away trying to fix your confounded printer. But what a nice sound when it starts spitting out text again!!! Feel free to share “heart job.” So glad the printer is in spitting shape again! What a beautiful week we had together! And I’m so glad you were able to extend it to continue your creative journey! Now we’ll just need to think of a new name for our group. It was a beautiful week. So blessed to be with everyone doing what we love. I read your words and I’m back in Maine. More, more, write more, Cathy!! Love your posts and hearing your voice.